Requested by a bridal shop for a display in their show window, this gown was inspired by the very grand 1907 celedon green damask dinner and ball dress created for Mrs. Peter Burns. We managed to duplicate the Burns gown quite nicely using a white damask with an overall pattern of butterflies, perfect for a spring or summer wedding. The additional features with this bridal ensemble for the bodice are swags of crystal beads on the front of the bertha, and on the sleeve hems. The glittering movement caused by reflected light creates a delightful aura around the bride as she walks or dances. The belt is a traditional Edwardian curved and sculpted shape with self pleating silk matte finish satin overlay. The skirt is the basic seven gore ball gown skirt, with the enhanced train of embroidered sheer in white, draped in two layers. 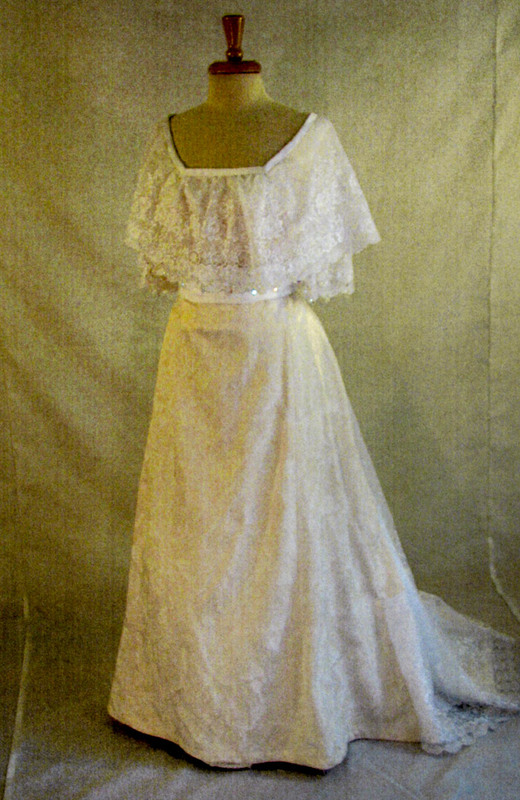 The underskirt of white taffeta with an 18 inch hem flounce is mounted to it’s own waist band. 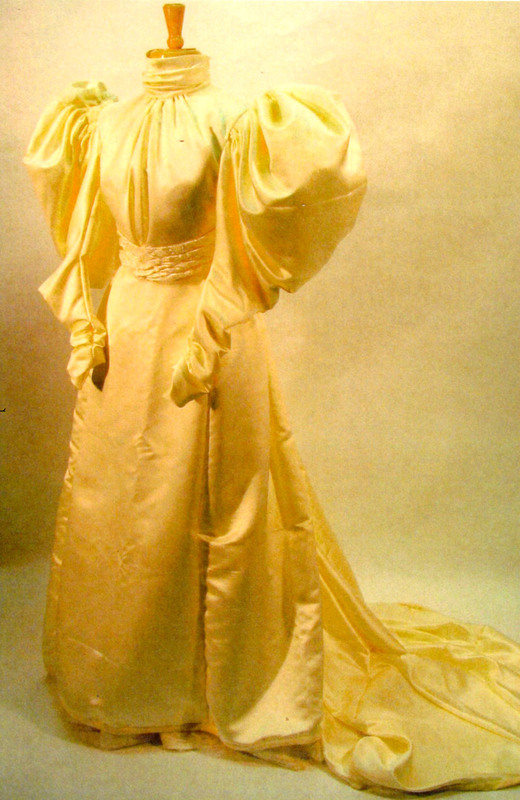 A jeweled tiara of floral designs and shapes would be splendid with this gown. 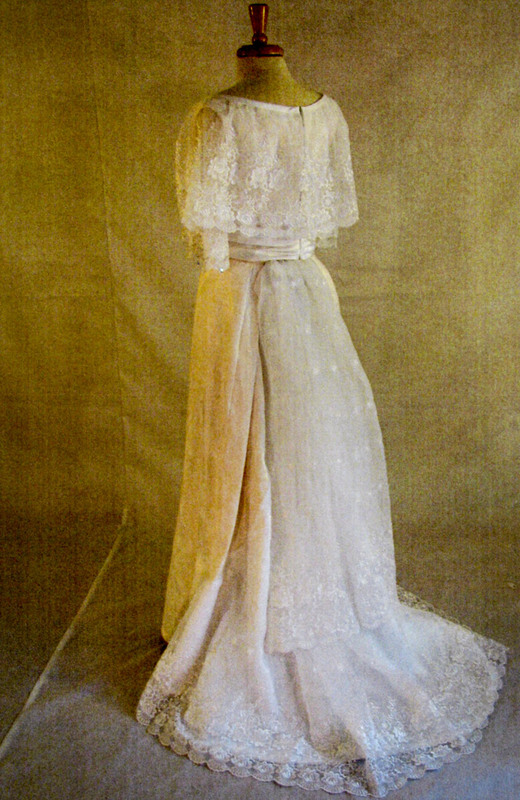 The same embroidered sheer, or an embroidered netting would make a lovely veil for the bride choosing this gown for her wedding. Even with the light hearted choice of fabric for this wedding dress this is a fairly severe and formal selection best used for an evening wedding.